Our February meeting will focus on the retail and restaurant environment in Clarendon and Courthouse. We’ll be joined by representatives from Arlington Economic Development and Market Common. Join us at 7:30pm on February 23rd. We’ll be meeting at the Hyatt Place Couthouse. Our annual priory setting and planning meeting for 2017 will be 7:30pm at the Hyatt Place, 2401 Wilson Blvd. Join us at their conference room to discuss how our civic association will advocate for and improve the neighborhood in the coming year! On July 22nd, from 5-7pm, the CCCA is co-hosting a community event, “Party on the Plaza” at the newly improved Courthouse plaza. There will be free food, music, games and more! We will have a table to talk about what’s going on with the civic association. Check out this flyer for more information and pass the word on to your neighbors. 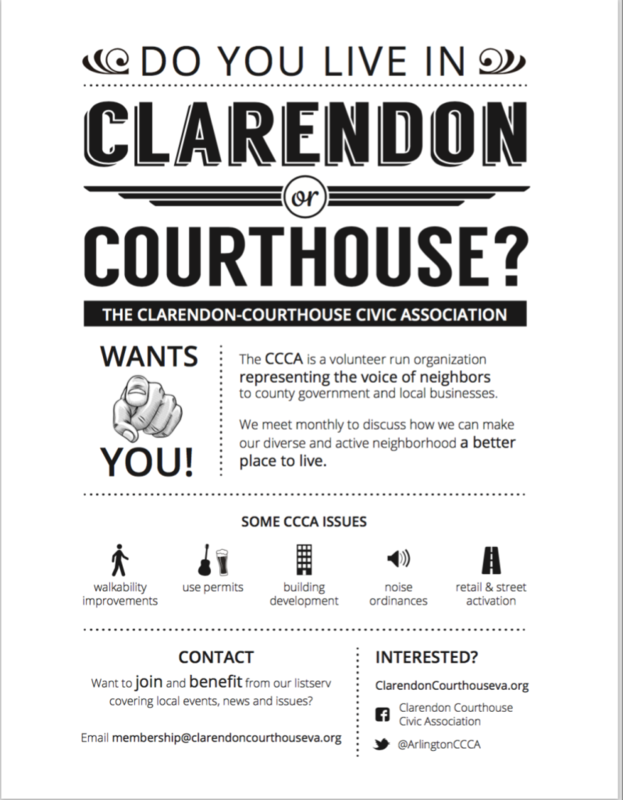 Our 2016 Clarendon Courthouse Civic Association elections are July 19th. Our meeting will be at 7:30PM at the Navy League building (2300 Wilson Blvd). February 16, 2016 at 7:30p.m. Please join us for our next meeting next Tuesday, February 16th at 7:30. We’ll be meeting at the AUSA building’s (2425 Wilson Blvd) first floor conference room. Tom Hutchings, Capital Projects Manager for the county’s transportation division, will present on the county’s plan to improve Clarendon Circle. January 19, 2016 at 7:30p.m. Leidy Perez-Davis, the Director of Outreach for our Congressman, Representative Don Bayer, will be there to talk with us about how the Congressman might be of help to the neighborhood. We will also engage in some 2016 planning and priority setting. October 20, 2015, at 7:30 p.m. The Courtland Park Community Room – 2500 Clarendon Blvd. Kris will discuss next steps for the Courthouse Square project, as well as other issues around development in Clarendon and Courthouse. A representative from the county’s transportation staff will discuss issues relevant to our community, including cross walks, signage and traffic issues. Now that we have a website, twitter and more active Facebook page, we will discuss how we want to make use of these resources.